Plans for Plac Nowy’s facelift are in danger of never making it off the drawing board as Krakow’s city council has so far failed to find so much as a grosz to kick-start their ambitious plans. Piotr Pakaszewski, of the city’s Communal Infrastructure and Transport Office (ZIKiT), confirmed to the Post that his team were still waiting for confirmation that funds – estimated at around two million złoty – would be allocated in the city’s budget, stating that he hoped a decision would be finally made in the early part of 2010. 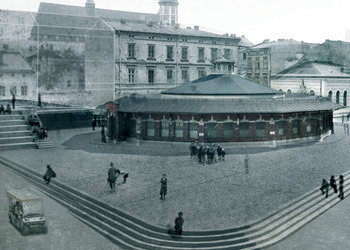 The news is a setback to the architectural office, Lewicki Łatak, whose plans envisaging a square harking back to how it appeared a century ago were chosen by the city as the winning bid this summer. Piotr Lewicki, one of the leading architects, said: “After the competition the city had to invite us to negotiate the contract for the executive design. They have [now] sent us a letter saying they cannot invite us, even if they are obliged to, because they don’t have the money granted in the city budget for 2009.” He added that as soon as a budget was allocated to the project the company would be brought back on board; but there was no guarantee that funds would be obtained by the council. With a cloud of uncertainty now hanging over the square’s future, developments of a different kind have been insidiously creeping up in recent months around the edges of Kazimierz’s premier watering hole. A fast-food outlet, Asia to Go, has opened on the square and it was quickly joined by a new neighbour, a gaudily lit “casino” promoting its services via an irritating, flashing neon sign jammed above its doorway. In reality, the venue is actually a dingy little room sporting a few sad fruit machines, and fortunately the Space Invaders-type electronic gimmick – more at home in train stations and airports ticker taping announcements – has now been removed. But its sudden appearance crystallizes a sense for many that Kazimierz really lacks a guiding force able to help shape the square’s appearance and presence over the coming years as somewhere that residents can be proud of and visitors can immerse themselves in, and all in a way that does justice to its chequered history. Piotr Lewicki is hardly any more enthusiastic about the signs. He commented: “The Casino Club gambling room suits that square neither more nor less than the other exotic signboards written in foreign languages: Asia to Go, Any Time – Summer Garden, Les Couleurs (Liberté-Egalité-Fraternité), Le Scandale… those signboards have nothing in common with the history of Krakow, Kazimierz and the square.” Perhaps ironically, given that the company’s design of the square will be reminiscent of how Plac Nowy looked a century ago, he adds that other signs which hark back to the past, the “atmospheric” signboards on the corner house at the entrance into Szeroka Street from Miodowa Street, “pretending that time stopped in 1939”, are even more out of keeping with the area. However, residents also have reservations about the winning design, concerned that the current produce stalls will be lost and that the square will be too focused towards promoting entertainment – adding to the weekly noise and chaos they already face. Some local residents felt sidelined during the original competition that picked the winning design and how the square is currently being maintained. With no sign yet of that multi-million złoty cheque to energise the process of sweeping away the neglected, tired and drab feel of the square, it really does feel that time might have stopped for Plac Nowy. ← Why Don’t Polish Shops Ever Have Enough Change?